WeChat, the cross-platform messaging app was recently launched for Asha Full touch phones. A less-advanced version was previously available only for keypad based Nokia X3-02/C3-01. The new redesigned application also brings the ability to record and send short voice messages from within the application. The app is well designed and does make you feel like you’re using it on a smartphone. It is perfectly optimized for the screen size and hence all the functions are easily accessible with easy taps. Making full use of the screen estate, the app properly arranges the available contacts and active chats. Chat messages are properly sorted in the conversation view which makes reading and replying easy. The app does not come with any external keyboard and uses the default keyboard of the phone which IMO is the best implementation as there’s always some sort of problem using the external keyboards. Besides written messages, users can also send photos by clicking from the camera directly or choosing a photo already saved in the gallery. Another great option that the app provides is the ability to record and send voice messages from within the application. To send a voice message, just hold down the call (green) key and speak. Release the key when you’re done recording. You can easily import your phone contacts into the application and directly start a conversation. Or else you can manually add a contact through his/her WeChat ID or phone number. There is also an option to link and import your contacts from QQ messenger and use QQ-related features on WeChat. How to download WeChat to your Nokia Asha phone? 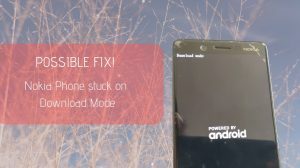 If your device is not among the list of supported devices, there are chances that the app can still work on your phone. If your phone supports WhatsApp messenger, it will definitely support WeChat as well. Leave a comment below if you need the jar (& jad) file for your unsupported phone. I want link to download we chat…. Not available for Asha Software Platform. i have been using wechat before in my phone(nokia asha 502).now it is not working. i try to download from store but wechat is not there. please help how i can using wechat again. Why can not support wechat in my phone Nokia asha305? M using asha 309. I had wechat in my phn. Bt aftr format i cdnt use wechat.. Pls help me. It seems that WeChat isn’t yet uploaded to the Opera Store. Please try contacting WeChat support team. Its uploaded but has the old version not the updated one. I had wechat on my Nokia asha 302 then deleted it now i want it but can’t find any for my device please help. I have nokia asha302… I deleted wechat and now i want to install again but i am not getting wechat app on nokia store now. Will u please help me how to install wechat? Khus hi to nhi hoon main??? When i am trying to download wechat 1.5 for my asha 308 it’s not working. But before i downloded the ap from nokia store and it was working. Now in opera store only the version is availabe 1.0. 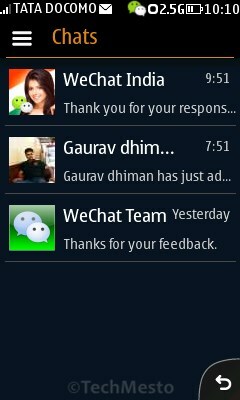 So plz tell me any one how can i downlod wechat latest version for my asha 308. Why wechat app is not supporting on my mobile? I like to use wechat but it’s not working on my mobile. Popeye, do you get wechat for your mobile! that is my fb profile name also. we can meet together on fb. ok? wen i can use watsap in asha 200, y cant i use wechat in it….. I have the Nokia asha 540 and the wechat app is installed on the phone. When i open the app keep getting this error (java.long.NoClassDefFoundError:com/nokia/mid/ui/lcdui/Indicator) can you please help me. Nokia 200 is not supported, unfortunately. How to view moments in wechat for asha 503?? Shouldn’t be available on these devices. Does not work on the 200, unfortunately. Which phone do you own, Sithandile? Benz, did you check the Nokia Store? it is work for nokia asha 311? I hv nokia asha 200.. Cn i use WeChat on my phne..?? It does not work on Asha 200. Sorry! good movement for Nokia, but there’s still many things to improve in this version! I am using Nokia Asha 503. I went on Wechat website using my phone and downloaded Wechat as i thought there would be updates. But now Wechat would not open. It is stating that an internal application error occured. What can i do to use Wechat again. Thanks. Do you have the latest version of Nokia Notifications App installed? I cannot download it..can you upload it for me so I can download it..
can u pls provide the jar and jad files. This file gets installed on asha200 but it says the phone is not supported. Then its not supported. End! Anyways..can u pls provide the jar and jad files..
the wechat app is available in nokia c3-00. i am using it. No fix possible. C3 does not have the required hardware/software implementation to determine the location via cell towers. So practically no way for the app to find where you are. Guess it won’t work on the 201.
i have asha 200. It supports whats app i want to download we chat send me .jar and .jad files. To download we chat. im using nokia asha 302 and it has whatsapp now l wanna use wechat how do l do so?? My asha 200 supports whatsapp but still not supporting we chat ??? WeChat does not support the Asha 200.
yes ,, my phone asha 200 is supported whatsapp but i can’t install we chat. My phn nokia asha 306 .im wan download wechat but canot send voice………….wht hapen ha . Have you tried long pressing the Green (Call) key? The key you use to pick up the calls? i want to use wechat on nokia asha 200..plz provide me jad or jar file as earlier as u can..
Where’s Store The Voice Messages In Nokia Asha Phones. Mostly in the Recordings folder in MMC. Well.. Unlike the newest Asha phones, C3-00 does not offer positioning via Cell Tower. There isn’t GPS either. So positioning ain’t possible. Not supported by Asha 200. While sign up, it says that unable to send sms on your mobile. What should i do? software we chat can’t work in nokia asha 501 and also not supported what’s app ……………..
WeChat works brother. Get it in Nokia store. WhatsApp is coming within a month. Am using nokia asha 201 i a,m using whatsap but no access to wechat plz help. It is not available for all phones. WhatsApp (whatsapp.com) works, WeChat doesn’t. Try line. Everything will support u r mentioned! i’m talking about ‘Line’ not wechat. I know wechat doesn’t work on my mobile. my handset is nokia asha 200. I want wechat. wechat is not supporting asha 501 wat to do????? It works in Asha 501. You can download it from the Nokia Store. Hi,i download wechat from nokia store,but it’s not 1.5 version!!! It’s 1.0 version! Hi,m using nokia X2-01 i’ve already downloaded WeChat bt when i starting to sign up it says “we are still working on your device”what is that supposed to mean? Then its not available for your phone. Simple? Hey.. My phone is a nokia X2-01 i dont get why it says “We are still …….. For your device” why? And when is it going to log in or sign up. I don’t see any chance of WeChat coming to X2-01. Go with WhatsApp only. It won’t work on the 302 brother. This is clean stupidity on the part of WeChat makers. hey,mine’s of nokia asha 200, i need a jad file. It won’t work on the Asha 200. It doesn’t work on the 201. Handset is not supported yet. I am having Nokia c3 -00 . i need jar file of wechat for this phone. hehe.. yeah WhatsApp has supported sending and receiving voice messages since long, but now they have implemented that in a better way. I too don’t see a need of WeChat anymore. WhatsApp is always better and supports better text messaging than the messy wechat. To be true, i don’t think it will ever come. They’ve supported the newly released Asha 501, which means that they are not ready to support the older models. You can better use WhatsApp. The text messages there were always better and now they have also introduced the Voice Messaging feature.. Just hold on record and release to send the voice message. i have downloaded we chat for my nokia asha 303…but can u tell me how to use look around and shake functions??? This is a basic app for the java based phones. Those options are not available here. i use nokia asha 201 can’t i enjoy this chat site too? I love it so much. Not yet brother. It is not supported as of now. i have download WeChat on the Nokia 305, but I can not send a voice message, What is the way of send the voice message. Press and hold the green key to record the message and release it to send. The problem is that it does not support Voice Messaging which is the only reason to use WeChat over WhatsApp. Yeah! Some of the rare apps that I’ve seen which work on some device and not on others. No point in adding a device specific limitation, instead let the user try if it works on a phone or not. helllo i m using asha 302 which do support watsapp bt doesnt support wechat….i jst wana know y??? Please help! I really want wechat…. Not yet. Maybe in the future. Well this app isn’t being developed by me, its wechat. I’ll however definitely forward to them that so many people are looking for an app for other phone as well. Let’s see what happens. 302? send me link plz. Do I can send video from we chat in my nokia asha 311? iam download WeChat on the Nokia 305, but I can not send a voice message, What is the way? 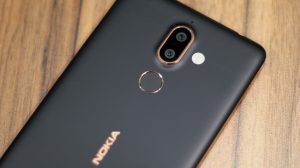 Does a nokia X2-01 support We chat?If yes please may you tell me how i can download it.thank you. Hi, I am using Nokia X2-01 and it supports Whatsapp Messenger as I’m already using it. So plz let me know if there is any .jar OR .jad file of WeChat is available. It is not working on most of the older devices including the X2-01. So not available. The developers actually decided to support only the newest Nokia devices and that’s really upto them to decide which phones can run the app and which can’t. if you’re using a phone which isn’t supported, try contacting them directly and ask them to make it compatible. wechat for C7 ? it can support whatsapp. It does not work on those phones. I download wechat on my asha201 and i saw LOGIN and SIGN UP NEW USERS but when i click sign up they said they are still working on my device i really need wechat pls when will they be 2ruw with the working pls? No idea. I doubt if they’ll ever make that happen. does look around option in we chat is not supported in nokia asha 305 ??? 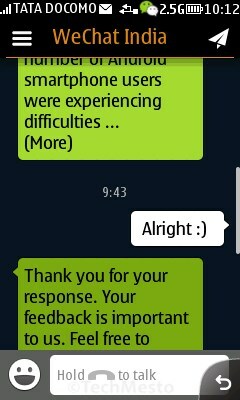 thks for your prompt reply but I am unable to find Shake, Look around options in wechat . I have search in all area of wechat for these option. Please navigate me or If I have update something in my Nokia asha 305 . 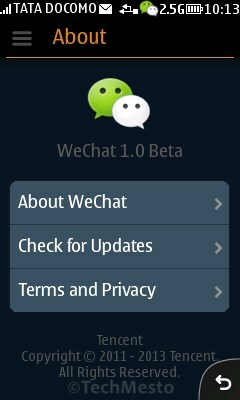 Currently I am using wechat ver 1.0. Please reply for below query .. When it is delivered in a format not recognized by phone, it will save as exe. Which phone are you using? It even doesn’t work on any of the unlisted phones, so not even worth trying. can i have WeChat for my asha 302 please. Sadly it isn’t yet available. Plzzzz………..cn u do wecaht for nokia x2-01 plz…….if nt we are missin out bathng plz…..
Press the Green Call key. i have downloaded wechat on my asha 302 but i cant find a register or sign up button.all i see is login.what happes if you are new to wechat.how do i sign up as new user???? When wechat will be available for nokia asha 302..?? Is we chat and Whatsapp work on nokia asha 305? Update your phone to the latest firmware first. Where did you download it for the Asha 302? Hi, I have already downloaded WeChat, but I can’t register to it successfully. I have a Nokia Asha 311, and I’m from Argentina. I keep on trying and still can’t do it. I would really appreciate if u could help me. Thnx! hi i downloaded wechat for nokia asha308 phone but am unable to sign up am getting error “unable to send sms verfication code”please suggest how to fix this error. Open Nokia Store> Search for WeChat> Install it. Simple! Im using nokia 303 and i already downloaded wechat. But when i used the recording part, it wont allow me to listen to it back and it says something like this ‘your profile does not support……..choose other profile’ what does it means? Need help! Thanks! Long press the Green Key. How to chat in We Chat? Where is shake n drift bottle option in wechat on nokia asha 308????? Its not available for your phone. I have nokia C3:00 S40 mobile,i have whatsapp also how i can get wechat.i realy want 2 use this app,this is nice app.plz let me know. i have an nokia s40 series phone,, i have whats app ,, bot y isnt wechat supporting ,,, it isnt onmy ovi store n nor im able to download on net,, by other sites,, can u please help me out ……. 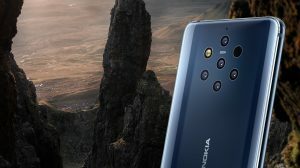 As of now, it isn’t available for any other S40 phones besides the full-touch. i use a Nokia Asha 303 and can’t find the Look Around option…not in my phone,eh? my device is asha 302,my device supported whats app but not support wechat.tell me the reason why? WeChat hasn’t created an app for this phone yet. Needed wechat for x2-01!! It supprts watsapp!! tengo un nokia x2-01 podria de alguna manera descargar wechat a mi movil? nokia asha 308 not able to send voice msgs. what to do?? I m facing many problm wit dis application….. So many peoples asking wechat nokia c3-00..
Can you do something to make it…. I want to download we chat for Nokia X2 01… ? Bt i heard that it will not available for x2 01 … Is it? No idea 🙁 It works fine for me. Maybe you need a phone reset? Are you running the latest phone software? I use nokia asha201.,n wats app works wel on my device,i’v even downloaded we chat bt wn i try to sign up its says we r checkng a new version fo ur device.,..is it stl nt launched fo nokia 201?? Hai,i use asha 311. I download and instal Wechat. Once i open Wechat its just blink one time. But wechat is not work.i click wechat its not open. I tried so many time. Please help me. Try deleting and re-installing again. Plus, which phone software version are you at? Nokia recently released 7.36.
when will wechat be launched for nokia asha 302 ? Try contacting WeChat for more details. You don’t need icon.. Just hold the green call key and recording wil start! What i meant was the physical green key. Which you use to pick up calls. Hello, is wechat going to be available for the Nokia C3 or not ? and why doesn’ t it work on nokia C3 ? No Idea 🙁 Maybe not or else they’d have developed already! Wechat not available for nokia asha 302?? had downloaded wechat in my nokia 311 but can not use it.whenever i m trying to use it shows a message “unable to connect”.long processing time and finally failure,,what to do? 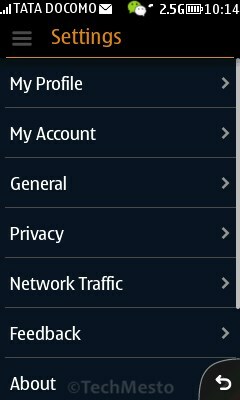 can you pls help,,,what to save in configuration settings to work that apps fyn??????? It works fine on Full-Touch phones. Hey….m using whatsapp of version 2.4 on my nokia c3-00 handset. N i wanted to downld we chat…cn u help me…..plz reply here or on my mail…. which ph u r using??? I’m using C3-00.. Using whatsapp. I have succesfully installed wechat. It opens bt when i click on sign up they say..we are workin on wechat for ur device.stay tuned…. Can we really use it on our C3-00….???? When..?? Will it work without a problm..? Could we use every function of it…? I want to know more..
Can we download wechat for nokia C3 00 in future or not?? Plzz tell me can i use nokia asha 201? hi i have nokia 201 and that support watts app but it does not support wechat pls suggest me or help me??? Try downloading and installing the app from the link in 1st comment. Looks like its working fine for me. What problem are you facing? Doesn’t it start recording or you don’t receive voice messages? What happens when you long press green key on your phone while in the conversation? Doesn’t it start recording? You might be needed to contact WeChat to report this error. But why is it working fine for me? Confusing!! I could not make a vioce message frm wechat in my mob asha 305. I hold down the call key but the key is hide(not green). hmm what do you mean? Pressing the green key doesn’t start recording? I could send pics to my friends on Wechat through my Nokia asha 308.Pls resolve my problem. You meant you could NOT send. Right? It works fine for me.. Can you tell what error you’re experiencing? how to install the we chat plz tel how could you?